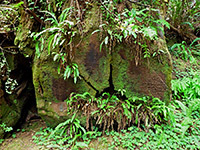 The Hatton Trail explores some of the forest on the south side of US 199, the main road through Jedediah Smith Redwoods State Park, staying close to the highway for most of its 2.3 miles, and so within range of traffic noise. The path climbs up to 350 feet above the highway, however, and is mostly out of sight, while a short spur to an isolated group of large trees (Lohse Grove) is rather more peaceful. Past this junction, the path soon descends back to the road where it meets the Hiouchi Trail, which continues southeast close to the Smith River, to the Stout Grove. 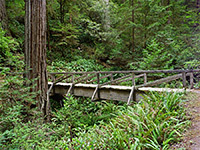 The usual start point though is at the western trailhead, as here the path first makes a very short loop through a section of overgrown forest containing many huge redwoods; fewer people continue along the main trail, as it climbs above the belt of the largest trees into more open forest made up of smaller redwoods, though the surroundings here are still atmospheric. 14 views along the Hatton Trail. The path begins along Hwy 199 opposite what used to be the trailhead for the popular Simpson-Reed Trail, now rerouted 400 feet away, along Walker Road. After moving just a few yards through the forest, the Hatton Trail reaches a junction, the loop section being to the right. In the clockwise direction, this ascends a little way via aged, mossy steps then drops back down to a second junction at the far side of the loop, were a 0.1 mile spur forks off to a named redwood grove. The return part of the hike is close to the road, and all of the path is through typically dense forest with lots of moss and shady undergrowth, and the usual mix of live trees, dead trees and fallen branches. 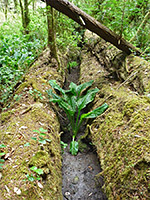 The main part of the Hatton Trail leads southeast from the initial junction, briefly level, passes a moist patch containing a cluster of big leaved plants (skunk cabbage), before commencing a steady but gentle climb across the hillside that borders the highway to the south. The route moves away from the road, winding in and out of a wide, sloping ravine, crossing a tiny creek on a newish-looking bridge, followed by more climbing and another, older footbridge, now moss-covered just like most of the neighboring trees. Two more small bridges follow in quick succession. The redwoods now are noticeably thinner than those on the valley floor close to the road, and the undergrowth is less. The path levels out, high above the highway though close in distance - vehicles are sometimes visible through gaps in the trees. 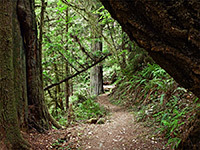 The next landmark is the junction with the 0.4 mile spur trail to the Lohse Grove, a narrower route that climbs via a few short switchbacks up to a flat area, becoming gradually more overgrown, with several recently fallen trees intruding onto the pathway. The trail peters out in the middle of a smallish group of somewhat larger redwoods, not particularly special, though quiet and little visited. Back on the main path, a quick descent takes hikers back to the highway, meeting it just west of the bridge over the Smith River. The Hiouchi Trail continues southwards close to the river, through generally uninteresting woodland.